Deep breath. Really sorry for the reality check, friend, but as a diabetic, the disease does control you. You can’t walk away and you can’t ignore it. The complications may not set in immediately but they will come. And you won’t like them. The irony is that prior to the advent of good insulin and blood sugar testing options, all patients just went low carb. It was the done deal. In 1917 Rebecca Oppenheimer published a diabetic cookbook that sensibly cut out flour, pasta, rice, bread and sugars and this old cookbook is more coherent than a lot of what is on our shelves today. It was truly only in the 70s and 80s that the idea came of “covering” these previous embargoed items with large doses of insulin. And through some decades of poor nutritional policies where fat was vilified and higher amounts of sugar crept into the normal diet, both diabetics and non-diabetics have been subject to increasingly more unphysiological demands on the pancreas. So the sad truth is that we have been misled. It’s not enough to “cover” a regular meal with insulin. It doesn’t work. It’s impossible to time the insulin exactly to blunt the post-meal spike. Furthermore, the dosing to match the spike often causes the glucose to crash low soon after. So many diabetics have glucose levels that swing frighteningly, but the same is true of non-diabetics. Non-diabetics do swing as well but their insulin reserves allow them to keep the swings in better range. So if most diabetics now know that a low carb diet is the best way to manage the disease, such that the swings are less dramatic, the insulin needs are decreased and the risk of hypos also decreases, then why don’t more people do it? I think this is because there is an insidious thinking out there that discipline is a bad word, and that we all have the innate right to do what we want. It’s called living without limits. And this is thought to be really a positive thing. Google “living without limits” and a couple of disability websites for cerebral palsy and autism pop up. I’m not trying to downplay the important message these websites have, but with regards diabetes I think we have to know our physical constraints and get around them. If you need to restrict your carbs, just do it. I looked after a boy who had a muscle condition and had limited mobility. We got him a great state-of-the-art wheelchair which gave him the wonderful freedom to move around on his own. But within a couple of months he had an accident and fell out of the chair – he had been driving his wheelchair at maximum speed and hadn’t been using his seat belt, so when he came to an abrupt halt, he rocketed out of the chair. It was traumatic. And that is similar to what we face – we have the motorized wheelchair now. Insulin and easy glucose testing allows us freedoms that previous generation diabetics never had. But we forget we need the speed control and the seat belts. By going low carb we put in speed controls so that our sugars don’t rocket out of control and by checking our sugars regularly, we make sure that our seat belts are on. So for those who think that the low carb life is unpleasant, undoable or unsustainable, here’s a recipe to meet those cravings. 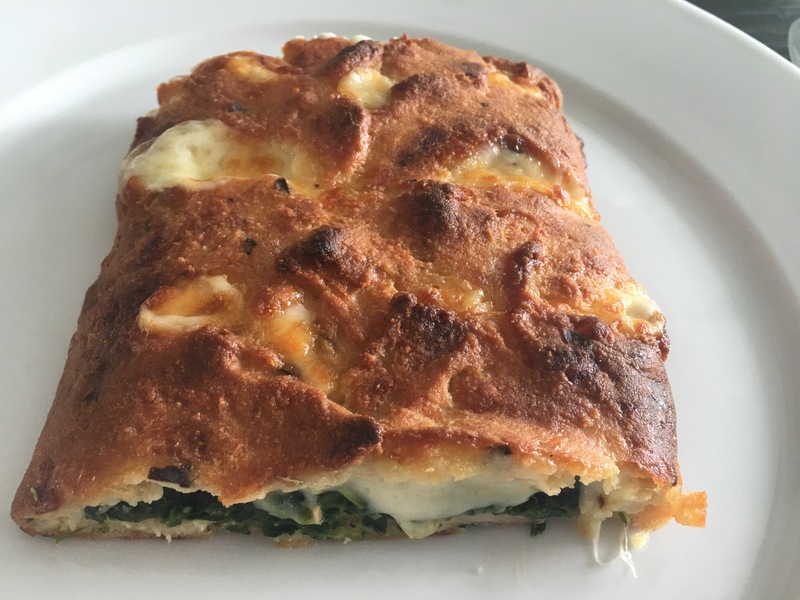 Stromboli is nothing but a turnover, very similar to a calzone except that the calzone is shaped like a crescent (a giant empanada or curry puff) and the Stromboli is rectangular. The fillings are similar to what you would expect to see on a pizza. The dough recipe is not novel but is from uplateanyway, but has been adapted slightly as I think the microwave method is too uneven and preparing the dough on the stove gives a better consistency. I really love spinach too and this is a great way of incorporating fiber into the meal. Preheat the oven at 200 deg C.
Bring a pot of water to a boil. Add the frozen spinach and boil for about 2 minutes, then drain and squeeze out the excess fluid. Set aside. Shred the mozzarella with a large holed grater. Preshredded cheese tends to have potato starch to prevent clumping, so just buy a block of mozzarella and shred it yourself. Melt the butter (about 30 seconds in a microwave). Set aside to cool. When cooler, beat in the egg. Mix the almond and coconut flour together together with the spices (onion powder, garlic granules, fennel seeds and crushed red pepper flakes). In a saucepan, melt the mozzarella cheese over low heat. When melted, mix in the almond and coconut flour and take off the heat. Add the butter and egg and mix well. The dough will be sticky. Place the dough on a baking tray lined with parchment paper. With a spatula, try to spread out the dough into a rectangular shape as evenly as possible. Mix the sour cream and spinach, and add in the onion powder, salt and pepper. 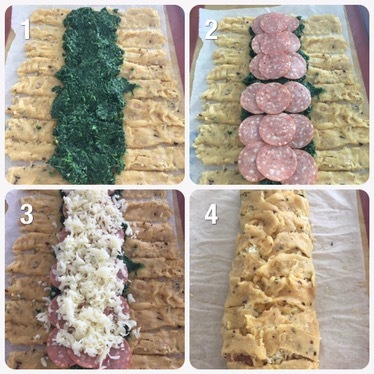 Carefully cut 3/4 inch wide strips on both edges of the dough, reserving the middle third for the stuffing. Spread the spinach mixture on the middle part of the dough. Lay the slices of pepperoni next, and sprinkle the rest of the mozzarella cheese on top. Carefully lift off the strips on each side and fold over the stuffing. Bake for 12-15 minutes. Serve hot. It was nice to see the information in the diabetic cookbook. Your Stromboli looks wonderful. Thanks Debbie! 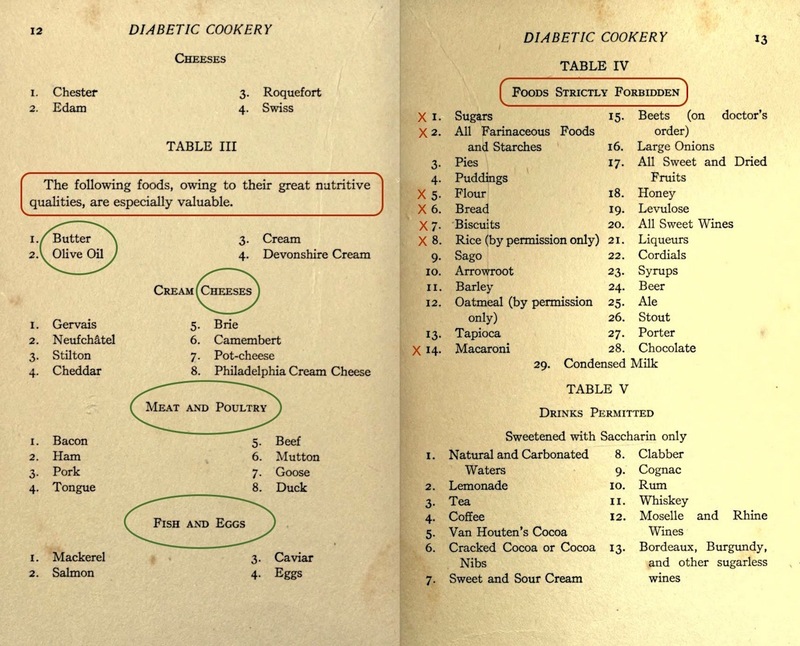 The old diabetic cook book is actually available online! You can Google and see.